Causam eXchange, a privately-held financial transaction technology company, is offering up to 1,000 U.S. accredited investors an opportunity to purchase equity ownership to bring unprecedented speed, security, and flexibility to billions of energy financial transactions each year. Energy transactions today use obsolete technology. Causam is revolutionizing how power is bought and sold. Proceeds from the $5M raise will fund the commercialization of Causam’s cloud-based software product EnergyNetⓇ to enable a clean, digital, distributed, and secure power grid. Causam earns transaction fees by helping energy providers ($100B annual revenues in U.S.) improve profit margins, reduce working capital needs, aggregate distributed energy resources, and provide cleaner energy to their customers. Invest in Dollars or Ether. Causam designed a versatile tokenized security offering to make investing in a private company fast, easy, and secure by leveraging blockchain technology and its expertise in smart digital contracts. 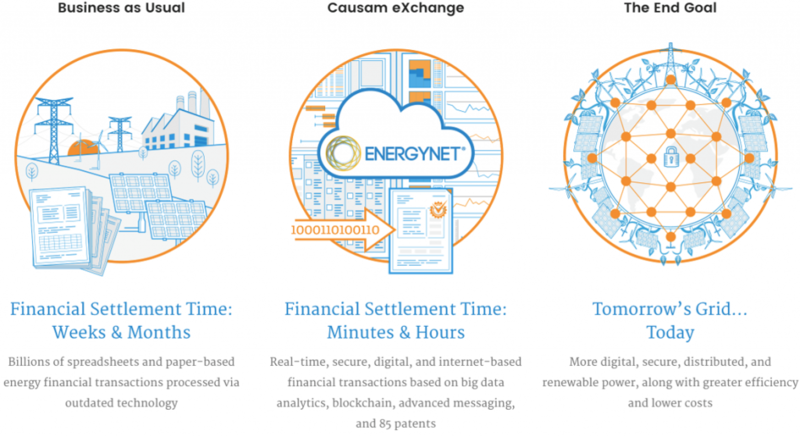 Backed by 85 patents and an executive team with seven prior company exits, Causam uses big data analytics, deep experience in the telecom and fintech sector, as well as smart digital contracts to automate customer onboarding (supply from generators and demand from commercial end-users), power trading, auditing, payment, and real-time settlement with anyone on the electric grid using blockchain technology. Causam’s initial product rollout is with retail electric providers by 2018 Q4 and green commercial building owners by 2019 Q1. Once EnergyNet is implemented for a customer, transactional revenues are slated to quickly scale with high profit margins. By 2020, Causam plans to expand EnergyNet beyond the distributed markets to address the $440B wholesale U.S. market.